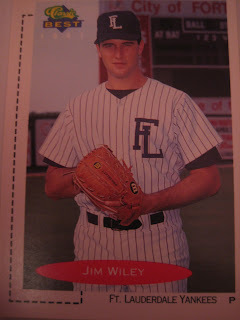 Jim Wiley pitched six seasons in the Yankees organization, winning 17 games. Now a Senior Sales Representative at Ash Grove Cement, he kindly answered my questions about baseball cards. "I havent collected cards in years. I really dont have any stories to tell. My advice would be, be careful when you send cards in the mail to be signed. You never know who is really signing them." Here is his card from 1991 Classic Best.